This time we have a pumpkin counting mat. Don't you love the tractor?!? Print the board and the numbers (0-10 included). 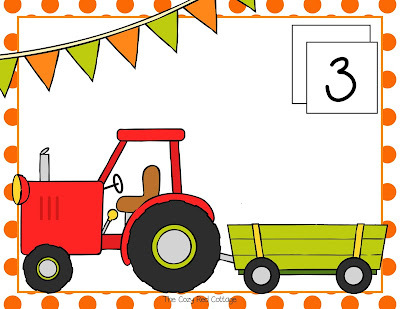 Place one number in the square and add the correct number of pumpkins to the wagon. For pumpkins you can use pompoms, play-dough, erasers, candy, etc. To increase the difficulty (& add some extra fine motor practice) add some tongs. Download this cute counting mat here!